Discussion in 'General Freemasonry Discussion' started by WellArmedTiler, Mar 5, 2009. If you're not a PM, what kind of apron are you allowed to wear? I've heard discussion from brothers about getting customized aprons with different insignia, etc, on it. I was reading through the Laws of the GLoT and saw (Title II, Ch 11, Art. 274) that the members aprons were supposed to be plain white. Is that referring only to the aprons furnished by the Lodge? Does that mean that the traditional English aprons are not allowed in our Lodges? They differ in that they have two rosettes on the apron for FC, and a third on the bib for MM, along with two lengths of cloth hanging from the bib. Upon becoming a Past Master, the rosettes are replaced with Levels. My understanding is that only a Past Master can have a blue border. All other aprons other than officers are to be white. 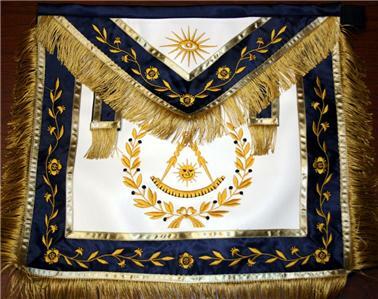 Exceptions being the Lodge of Research apron and Tranquility Lodge 2000. Black burial aprons are strictly forbidden. Thanks for bringing up the LoR apron. I meant to include that in the original post. So those are approved for wear in meetings of your normal Lodge? I know that the Tranquility Lodge 2000 apron can be worn in a regular meeting of a blue lodge , PM or not. I am not sure about the Lodge of Research apron as far as wearing it in a blue lodge meeting. Those are nice! I would really like to be able to wear a custom apron. I wonder how a proposal to GL to wear custom aprons would go over? Long ago it used to be the fad to customize your apron with Masonic emblems and I can only imagine the conversation that arose out of explanations for the individual designs. To me it is a form of Masonic Art, a way to express our feeling of the craft to on another and it is a shame it is gone. Washington's Apron that Lafeyette gave him is one of my favs and it is busy as it can be. I have an aquaintance through work here in Austin that is a member of a Lodge north of Austin. He is from South Africa and says he wears a customized apron in Lodge here in Texas. The Apron was sent to him from his lodge in South Africa and so he wears it. I believe he was raised here in Texas though. 3. Wearing the same apron to me is significant as it (and this will sound flaky but hear me out) gains significance from repeated wearing. Think of it like wearing a favorite pair of jeans or hat. There is memory attached to it and it gains more significance. plus it puts the person in more of a mindset for work when wearing a specific apron.